One of the important deciding factor, when plan to pursue education abroad is the potential of career prospects. Few of years ago, UK and the US were the most popular destinations for perusing higher education. However, with the current tightening of post-grad work visa rules and regulations for these countries, various countries like Singapore, Australia, Canada and France are enticing Indian students. In the previous year, Canada had almost 114,000 international students from over 200 countries and the maximum of these were from India. The Canadian education system provides a rich learning and excellent research environment, at an affordable cost. Canada has both big and small universities. Couple of these universities are at the heart of the countries largest and the most vibrant urban areas. Few of the other universities are located in small cities with an easy access to wide spaces and natural beauty. We, at MoreVisas provide knowledgeable guide to the candidates who aspire to migrate to Canada. The universities in Canada offer innovative approaches to learning which include co-ops and research internships. Many overseas students are fascinated by the opportunity to learn French in Canada. The extraordinary feature of the Canadian education system is that it allows international students to stay back after completing the program under the Post Graduate Work Permit Program (PGWPP). They can also gain relevant international work experience after complete their course. Post Graduate Work Permit Program provides the graduating students with relevant Canadian work experience. International students can secure employment anywhere in Canada for a period of three years after completing their studies. The work permit of course will not be valid longer than the length of the duration of the student’s course. Toronto provides diverse employment markets in Canada for students to add work experience to their resume. Few of the provinces, like Manitoba and British Columbia, provide a fast track to permanent residency status. It is a big opportunity that makes it worth for an international student to invest in a Canadian degree or diploma. More than 80% of international students at University of Toronto feel that long term employment was an important factor for gaining international experience. Many of the programs in Canada come with the opportunity to get a co-op in their field of study. More than 75% of the programs at George Brown comprise a co-op work term. 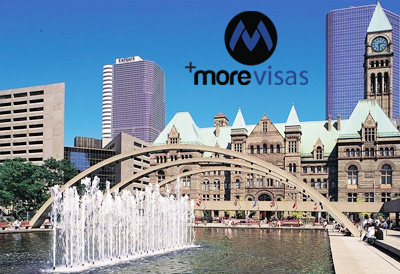 MoreVisas can assist students in processing their visa application and documentation for Canada Student Visa. This work permit is provided job related to the student’s field of study. Many of the programs provide work experience into the core curriculum. The cost of living in Canada is high when compared to the US. Students are allowed to work on campus and off campus depending upon their requirement. Registered full-time candidate with a study permit is allowed to work on-campus without any work permit. Students can also apply for off-campus work permit. To be eligible, they should have a valid study permit registered in a full-time program. The candidate must be in good academic standing and should complete six months of full-time study.